Mowachaht/Muchalath elders are planning for the re-interment of ancestral remains recovered from Nootka Lighthouse last summer. 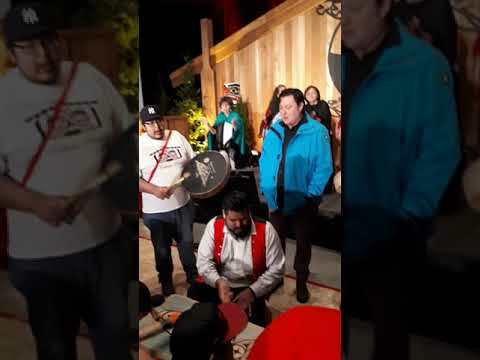 The NTC Quu'asa/Teechuktl (Mental Health) team paid a visit to Seattle’s Duwamish Longhouse Dec. 7 and 8 to spread some holiday season cheer and celebrate Nuu-chah-nulth culture. Putting more Indigenous teachers in front of Aboriginal learners is the goal of new funding for Vancouver Island University’s Cowichan campus. It appears organizers will need a larger venue in 2019, after this year’s Feeding the People lunch packed the Trinity Church’s dining hall with wall-to-wall visitors eager for a hot meal. The threat of the steelhead’s extinction has forced provincial officials to take the unprecedented step of closing the Gold River and its tributaries for winter angling. The Nuu-chah-nulth Urban Gatherings continued on Thursday when the Teechuktl Mental Health team came to Vancouver. Dozens of resource people accepted the invitation of Maaqtusiis School to deliver information about education and career choices at the Annual Career Fair held in Ahousaht on Nov. 29. A collaborative community and harbour cleanup - considered the first on this scale in Canada - is nearing completion on Flores Island. A dramatic rise in tourism on the west coast of Vancouver Island has corresponded with greater challenges for families trying to make ends meet, according to a report released in late November. The latest Huu-ay-aht documentary project is conceived as a catalyst for community resurgence and renewal, an example for other west coast communities, said Chief Counsellor Robert Dennis Sr.
On Thursday, Nov. 29 the Uchucklesaht Tribe held a health fair at the Alberni Athletic Hall, giving local providers an opportunity to present their healthy services to the community. With most of the west coast of Vancouver Island’s catch going to the sports fishery, the DFO is reviewing its policy for determining fisheries allocations among different user groups. The public had the opportunity to weigh in on traffic and safety concerns for Cathedral Grove through a series of open houses hosted by the Ministry of Transportation and Infrastructure (MoTI). The Nov. 4 rainstorm that muddied water reservoirs in Ahousaht and Tofino also took a heavy toll on Hesquiaht Lake, 51 kilometres northwest of Tofino. Three award-winning Nuu-chah-nulth athletes have been recognized with a prestigious accolade.